The impact of health-related news in today’s society is increasing as is its awareness to the globalisation of the worlds’ habits and threats, as well as of the pursuit of a better quality of life. The risk for news media bias and the consequences it might have in the population is of great concern to Public Health. News media bias is a ubiquitous phenomenon that has generated various research studies in different fields. Practically any media outlet can be biased, but the public should be aware of it and news media bias should be minimised thereby offering more objectivity to the news reporting. Health related news, in particular, have a high impact on the population that tends to be more sensitive to their content. It is fairly well known that the media plays an influential role in public responses to health issues. Often, the complexity of the information (due to the fast development of medicine) and lack of detail can lead to misinterpretations and unconscious bias. Another angle on news media bias is the amount of news over certain disease related aspects that are more abundant in media sources that are located far from the happening, providing us with an idea that the happening is local. An example of this in the public health scenario is large amount of news in the USA about the Ebola outbreak and the small number of cases detected in this country. The frequency of news items can be sometimes confused with its potential impact in the local citizens, by the less informed audiences. The transfer of that unclear message to a diversity of social media channels is then inevitable as well as the consequent multiplication of the misinformation and unconscious news bias. Unlike general news, the health related topics are most often close to the interest of the general public, with a large impact in the social media. An example of that is the ongoing public discussion worldwide about child vaccination. However, aside from the popular diseases (such as influenza, measles, etc. ), the media coverage is often not complete or does not provide an accurate coverage (not all topics are news worthy). The rising popularity of a certain disease implies the increase of the mentions to it in the media, not in parallel with the status of the disease itself. This sometimes falls into what is known as mainstream bias, i.e., a tendency to report what everyone else is reporting, and to avoid stories that will fall out of the core of popular news. On the other hand, not always the awareness of a certain disease or the general status of Public Health is well represented in the media. And most of the times this lack of representation reflects the incomplete awareness of the general public to the state of the health nationwide. It is also the case when that awareness is higher in some countries and smaller in others. This is often the case differentiating the so called developed countries to the so called 3rd world countries. An example of this is the coverage of the news about the Zika virus outbreak in 2015/16. This and other related facts can be demonstrated using the worldwide news data exploration platform – Event Registry. It collects and annotates in real-time news articles published by over 100,000 news publishers worldwide. It provides the user with public health news articles in 10+ languages as well as world events mentioned in these articles, permitting to explore what is currently being reported about in the media worldwide. Figure 1: The concept trends associated with the query “childhood obesity” over the worldwide news during July 2018. The user of ER can, thus, query the dataset of worldwide news on “childhood obesity” to explore the trends and major concepts related with this query through the mentions in worldwide news (see Figure 1). Trending information is computed by comparing how frequently are individual concepts/categories mentioned in the articles. By default, trends are computed by comparing the total number of mentions of a concept in the last two days compared to the number of mentions in the two weeks before. The trend for each concept is computed as the Pearson residual. The returned concepts are the ones that have the highest residual. In particular, Governmental Institutions are interested on what is the public opinion over Public Health related laws such as the Sugar Tax, where sentiment analysis can be an approach with great potential. This and related measures were applied in several EU countries to fight against childhood obesity and consequent diseases such as diabetes mellitus type 2. The role of social media is of great importance in this context but also contributes with much noise. A query on “Sugar Tax” in ER permit us to identify not only the news articles about this measure but also the social media mentions of those news, permitting the user to estimate the impact of the issue in the population. Figure 2: The categories associated to the query “childhood obesity” over the worldwide news during 2018. This shows that the media coverage of school meals nutrition in the context of Public Health was only 0.36% of all the news about this topic. Also some of the ER visualisation modules can help us to explore what is the news coverage of a certain health related measure feeding the general population awareness. 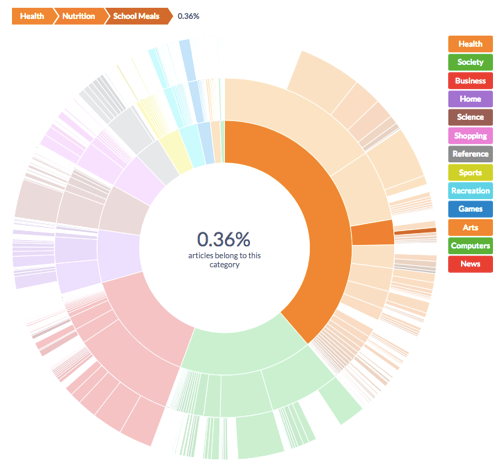 In Figure 2 we show a screenshot of the pie of categories of worldwide news associated to the query “childhood obesity”. In that visualisation module we observe that the media coverage of school meals nutrition in the context of Public Health was only 0.36% of all the news about childhood obesity during 2018. On the other hand, there was a coverage of 4.42% on child welfare in the context of the Society category, while the coverage on the business about sweeteners was of 0.94%. This topic will be presented by a talk by this author at the Data and Algorithm Bias Workshop, integrated in the 27th ACM International on Conference on Information and Knowledge Management. Meet us there to further discuss with us the future of health news monitoring.